Today we’d like to introduce you to Michelle Mimi Sanchez. Michelle Mimi, let’s start with your story. We’d love to hear how you got started and how the journey has been so far. I’m originally from Texas and I moved to Miami 5 years ago to try to break in the world of music. I’m an aspiring pop singer/songwriter and it was always my dream to move to Miami and work with the Latin record labels. As life happens and it takes you in many directions, I put my pursuit of music on hold 3 years ago and was influenced to start a Miami Lifestyle Blog. In just a year after starting my blog, I got to cover many special events and work with amazing brands. I realized that having the title of a blogger in Miami opened so many doors that I decided to keep investing in it and see what can happen with it. Being a blogger also gives me the credibility of a social media expert and helps me bring in leads as a Social Media Consultant. I’ve haven’t given up on my pursuit of being a songwriter, so I’m back in the recording studio all this summer! I’m enjoying growing my social media community and aspire to influence others to not give up on their dreams as they see me chasing mine! Of course, it’s NEVER been a smooth road. It never is. A few struggles in my journey as a female signer was that some try to take advantage of you. It was very discouraging and to be honest that’s why I took a break from music and starting my blog. I’m getting back to it by writing and getting into the studio to record. I do it for me and my fans that support me. If one of my songs ever make it big, coo! But if not then, just the accomplishment of completing a song and sharing it with my fans is enough. It makes me HAPPY! The advice I give to other young women is that you have to create your own opportunities. Don’t wait for others to just come and give it to them to you. You have to believe in yourself first, invest in yourself and have different strategies for your goals. Don’t be discouraged if something doesn’t go your way or life takes you in different directions. Because we tend to plan things and expect them to come out our way. In reality, it never does!! And it’s ok, that’s LIFE! Alright – so let’s talk business. 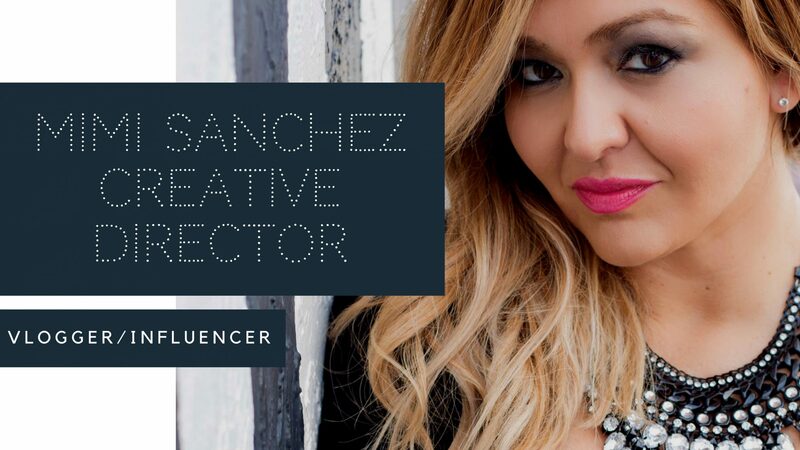 Tell us about MiMiSanchez.com – Miami Lifestyle Vlog – what should we know? As for my professional work, my background is in Public Relations/Marketing/Social Media. I specialize in Social Media Content Strategies. Most proud is my nominations for Best Storyteller Content Creator by a conference called Hispanicize. What sets me apart from others is I’m an opportunist. I have trained myself to seek and create my own opportunities. Also, I have a strong mindset and I bring people to my team and my life that is always going to be positive. I feel like balancing it all is the biggest barrier in life! We’re expected to look like Barbies, be smart, be moms, be housewives and be a career woman. I’ve yet to hear a woman say that she just wants to be a housewife. Those times don’t exist anymore. Women nowadays have to have leadership in all of her roles and the only way to stay sane is by having a strong support team.